Editor's Note: Radiology Today's Tony Fioriglio attended the recent Society for Imaging Informatics in Medicine (SIIM) annual meeting. This article represents his observations on the sessions. IT is changing health care just as it is most aspects of modern life. That was on full display at the SIIM 2015 annual meeting in National Harbor, Maryland. The meeting emphasized advancements in technology as health care switches to a system revolving around value-based care. Additionally, a full load of educational sessions was offered to those in attendance on an assortment of topics. However, by the time the meeting concluded, it became clear that the meeting had a common message: Technology is rapidly evolving and radiology must adapt in order to provide the best possible care to patients. Fortunately, the technology that helped create the perception of only treating images may also help radiologists overcome it, according to Rasu B. Shrestha, MD, MBA, chief innovation officer at the University of Pittsburgh Medical Center, who spoke at SIIM. "I don't think we could have been talking about value-based health care, value-based imaging 10 or 20 years ago," said Shrestha during a session titled "Providing Value Based Healthcare — Should Imaging Lead, Ride Along, or Get Left Behind?" He pointed out that with nearly limitless amounts of data increasingly available, the cause for concern switches from having not enough data to having too much. According to Shrestha, the vast amounts of data available could become a burden to radiologists attempting to incorporate them all, rather than just the vital information needed to best treat patients. "We are data rich and information poor," Shrestha explained, adding, "The goal in many ways is to simplify." The challenge is collecting the data from disparate sources, delivering them to radiologists to inform their reads and include in their reports to help treating physicians plan the patient's care. The goal appears to be to incorporate as many data as necessary to treat a patient as efficiently as possible in a measurable way in order to prove value both in the present and in the future. 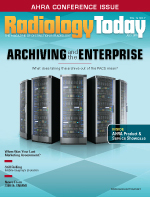 Industrywide consolidation increases the challenge of these tasks and the opportunity to the radiologists and imaging organizations that master them. "There are massive levels of consolidation going on across the industry," Shrestha said. 2. Out with the old PACS, but not right away. One common element in multiple sessions at the SIIM meeting was audience engagement via impromptu hand polls or text polls. These "surveys" mostly yielded results in line with what one would expect. However, one area that was particularly revelatory regarded PACS. During a session called "Look Ma, We Lost All the QA Operations and Annotations in the New PACS!," approximately one-half of the approximately 100 attendees present responded that their current PACS is at least 10 years old. A separate hand poll showed that among those that have recently switched PACS, it was nearly unanimous that both the old and new systems had to run concurrently for at least a year. While some of these results have fairly basic explanations, particularly those regarding running both the old and new system concurrently, the fact remains that many radiology groups must still work with older systems, which could present some complications as imaging technology continues to advance. For example, as digital breast tomosynthesis continues to be used more frequently and increases in popularity, storing those images has become something of a concern for many PACS users. During a town hall-style meeting, "Digital Breast Tomosynthesis: Ready for PACS Prime Time?," multiple users discussed their experiences working with the images. Several users said the complication came not from storing the images but from extracting them, adding that because of their size, it was hard to burn them to a disc or condense them into a different file type. Additionally, several imagers who had not yet made the upgrade expressed concern over both the cost and the possibility that image quality could be lost if the images had to be condensed in order to be stored. "These objects are big, but not so big that they're scary," David A. Clunie, MBBS, of PixelMed Publishing explained to alleviate some of those concerns. Both the vendors who participated and those in the audience who already had experience dealing with digital breast tomosynthesis seemed to agree that as technology like this becomes more prevalent, PACS vendors will need to update their systems and accommodate newer imaging types and techniques or risk becoming irrelevant in the market. These concerns can be even more pronounced for those imagers currently relying on decade-old PACS. 3. Security measures must evolve with technology advances. Tablets and smartphones are becoming more and more prevalent, not just in radiology but also in health care in general. As a result, traditional data security methods may no longer be sufficient due to the nature of the devices. Additionally, as more health records are stored on traditional or virtual servers, there are now more areas where security breaches can occur—and they are happening. "This is a topic that is rising almost to a crisis level," James T. Whitfill, MD, CIIP, CMO for Scottsdale Health Partners and president of Lumetis LLC, said during an educational session that focused on keeping patient data protected, "IT Security in an Insecure World: Holding Back the Dike." According to Helen Oscislawski of Oscislawski LLC, a law firm that focuses on health care and privacy law, there are several basic steps that can go a long way in keeping data safe and avoiding careless breaches. "First of all, don't be stupid," Oscislawski joked with the audience. She went on to explain that simple measures such as not sharing your password or login credentials with anyone, no matter the circumstances, is an incredibly easy way to avoid any potential security lapses, as is not accessing patient information except when treating that patient. Additionally, Oscislawski recommended that all imagers look at areas where others have had to settle with the Department of Health and Human Services/Office for Civil Rights due to security breaches. These include sharing information through nonencrypted sources, such as text messages or unsecured e-mail; disposing of records in an inappropriate manner; and a lack of security policies in place. However, while following those simple steps may help prevent many breaches, outside sources remain a threat. According to a study conducted by Symantec and presented at the SIIM annual meeting, health care data were the most frequently stolen in 2014, accounting for 37% of all hacks due to the value of medical records on the black market. According to Ryan Roobian, CIIP, health care systems engineer for Symantec, this is due to the permanent nature of the information contained in medical records (ie, full name, social security number, date of birth) compared with the relatively short shelf life of a stolen credit card number. Roobian also said that the number of major health care breaches doubled from 156 in 2012 to 312 in 2014. 4. Mobile technology's HIPAA implications are still uncertain. At the educational session titled "mHealth: Taking Personalized Medicine and Population Health to a New Height," it was revealed that 76% of doctors and 70% of nurses use either a tablet or smartphone. These medical professionals could be using their device to check a patient image to assess the healing progress of a wound or monitor medication adherence or any number of other purposes on one of the more than 40,000 medical apps. Despite the prevalence of the technology, however, a gray area still exists when it comes to the use of such technology with regard to HIPAA. Additionally, there are questions as to whether FDA clearance is required for the use of smartphones. Rulings from both agencies will almost certainly be needed sooner rather than later, as the use of smartphones in medicine becomes even more prevalent and the costs of the devices continue to come down—to the point that they may be cheaper for patients than traditional monitoring methods. 5. Communicating a clear merger/acquisition plan goes a long way. Mergers happen, as do outright acquisitions. Based on the amount of participation in SIIM's "Eating At or On the Table — Hospital Being Acquired and Acquiring a Hospital" town hall session, it seems that no two mergers or acquisitions are exactly the same and each comes with its own set of complications. However, several themes did appear as the discussion moved forward, most notably when it comes to environment and employee comfort level. For acquisitions, the acquiring hospital or practice can simply absorb the organization and largely dictate how the acquired organization's IT systems will be brought into preexisting infrastructure. Good communication improves the process, but decisions are driven by the acquiring organization. However, when it comes to mergers, handling employees and IT infrastructure must be done more delicately when the two organizations are entering into a more equal, or mostly equal, partnership. Notably, deciding on what PACS to use if the organizations use different vendors could be one of the most important decisions made during a merger and, based on comments during the town hall session, it's not unheard of for the previous organizations to continue running their own PACS in the short term while the rest of the kinks of the merger are worked through. Ultimately, however, the most important part of any merger or acquisition is that a clear plan is in place and is followed. Additionally, ensuring that any and all staff are aware of the plan will go a long way in ensuring that the merger goes smoothly, according to Kimberly A. Baldwin-Barnett, RT, CIIP, of South Jersey Radiology Associates, who was one of the leaders of the town hall discussion.